In the beginning, there was Kickstarter. Yes, I know a whole bunch of other stuff happened in the world before that, but Kickstarter is really the impetus for this story, so we’ll begin our tale there in a time long since forgotten… 2013. Yacht Club Games, a recently formed studio helmed by a fellow named Sean Velasco, had a hankering to make a game in a similar vein to Mega Man and Duck Tales, as one tends to do. Of course, making games is a serious expenditure, one that Yacht Club needed some help with. Taking to Kickstarter on March 17, 2013 to announce their very first game, Shovel Knight, Yacht Club were inundated with funding from a variety of sources. Famous YouTubers jumped on the funding bandwagon, and even made some contributions to the overall game, and by the time the campaign ended, their $75,000 goal was smashed and the final total reached over $300,000. Fast forward through some unfortunate delays, an eventual PC release and the announcement of free DLC updates in the future, we arrive at today: Shovel Knight is finally here on Xbox One and PS4. You might be wondering why I’m leading you on this short journey of the history behind Shovel Knight but I wanted to try to convey a certain message from the opening paragraph. I wanted you to understand that Shovel Knight is the product of love. This isn’t to say that other games I’ve played recently aren’t, not by any stretch of the imagination. There’s just an underlying passion for making great games that bleeds through the screen, the controller and even the speaker that you just can’t help but be charmed by, in between bouts of good old school platforming frustration. This is the first thing that you’ll learn about Shovel Knight: his, and by proxy, your adventures are pretty tough. Despite possessing a health bar, just so much as grazing a set of spikes will result in Shovel Knight’s obituary appearing in the local paper. Death, for the newly arriving fortune hunter, will arrive swiftly and frequently, as you begin to acclimatize to the physics, the speed of Shovel Knight, along with the tools at his disposal and his lofty jump, Even becoming accustomed to the basics isn’t enough to stave off the Grim Reaper. You see, each level is a challenge unto itself, containing gimmicks unique to that area. The Lich Field is periodically plunged into total darkness, requiring you to use the shadow outlines to navigate the various obstacles. The Flying Ship has you dealing with turbulent wind conditions, on top of the obligatory “fall to your death” pits, and of course, you have the standard Ice and Underwater levels that have become a lynchpin of the genre. Fortunately, Shovel Knight is equipped with much more than a shovel and a “can-do” attitude. Just like Mega Man, you’re given a wide variety of tools which can be utilised on your journey, except you buy or find them out in the levels, instead of Mega Man harvesting them from the bosses. Some help with secrets and loot, some help with traversal and some are purely for combat, but all of them have their uses, which is great. Too often in other games, you’ll find items in your inventory that gather pixelated dust, but not so much in Shovel Knight. Between these levels, there is an underlying plot, which is actually quite touching and rather well implemented. It even sets up some further exposition between the relationships of certain characters and enemies that could be fleshed out later. There’s a depth that I wasn’t expecting, and, just like all the other features, it charmed me completely. In a condensed form, Shovel Knight and best friend/potential love interest Shield Knight were on top of the world, until the discovery of a cursed amulet left Shovel Knight unconscious. When he came to, he found that Shield Knight had disappeared. After adopting a life of solitude, Shovel Knight decides to return to the adventuring life when the evil Enchantress and her Order of No Quarter begin to terrorise the land. Along the way he finds himself pursued by the Black Knight, Shovel Knight’s equal and rival, who seems determined to stop Shovel Knight from reaching the Enchantress’ Tower. But who is the Black Knight and the Enchantress, and what relation do they have to Shovel Knight? Intrigue and discovery await! 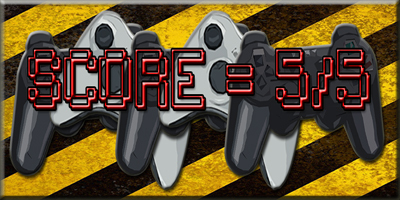 Players here will find a good amount of levels along with hidden bonus fights. I say hidden, everyone’s now aware about Kratos and the Battletoads, but there’s more than enough content here to sustain the most diehard of platforming aficionados. There’s even a New Game Plus mode, and the achievements are conducive to the hard-core crowd who yearn for multiple playthroughs and the chance at bragging rights (the end credits show you the fastest completion time in the world, just for context). This is a game that can gain traction and occupy the lives of gamers from all walks of life, which can only be a good thing! Speaking of the boss fights, Shovel Knight has got a whole bunch of evil denizens for you to test your mettle against. These are often tense battles that require you to learn the pattern of each boss, otherwise you will fail. Hard. Some boss fights, like Spectre Knight, have some tricky patterns to deal with, especially when you’re a lowly newcomer still getting to grips with the game. In contrast, Tinker Knight, whom you face towards the tail end of the adventure, is somewhat of a pushover, especially after Shovel Knight has been considerably beefed up. This mild drop in difficulty is instantly remedied by the last 3 levels, which typically give you some of the toughest challenges you’ll face, and that goes double for some of the bosses, which include those dreaded spikes that Mr Knight seems to be so allergic to. I’ll be honest, more than a little bit frustrating, especially during the penultimate challenge which sees you run the gauntlet against the Order of No Quarter, without a checkpoint. 8 boss fights in a row, with one particular guy using those spikes. It’s certainly daunting, but not impossible, which could be the tagline for Shovel Knight as a whole really. Looking for recent points of comparison, the most relevant one I can think of would be Volgarr the Viking. Whilst a different, more methodical and ultimately more punishing platformer, Volgarr has similarities to Shovel Knight as they both harken back to the days of old school platforming on the 8/16-bit console generation, whilst also using loot and score penalties in lieu of a finite amount lives to punish player deaths. The key difference though, and the one that makes Shovel Knight a much more agreeable title, is that Shovel Knight has actually heard of checkpoints, yet still offers a firm but fair challenge. You can also destroy those checkpoints to make things tougher for yourself if you so wish. Volgarr, on the other hand, throws you into a pool of sharks and demands that you break the World Record for 50m Front Crawl, with an almost masochistic approach to jump distance, enemy placement and its refusal to give any form of real guidance. 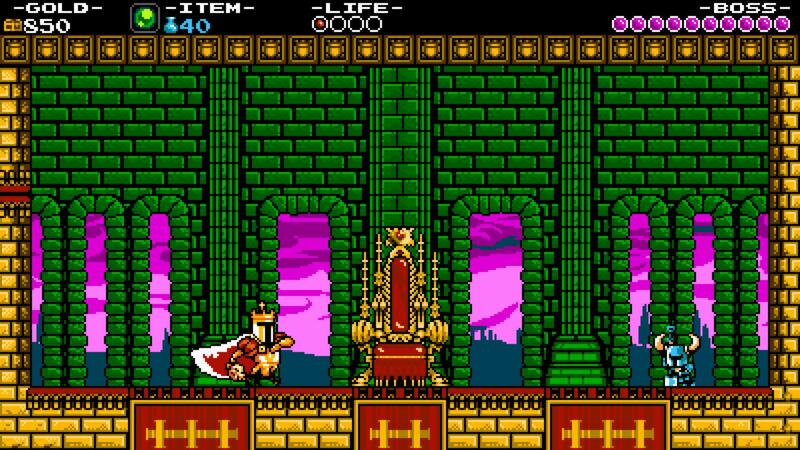 The real challenge comes from trying not to cry whilst the game bends you over the barrel… But I digress, this is about Shovel Knight, and how awesome it is. However, you may have noticed that I’ve compared Shovel Knight to games like Volgarr, Mega Man and Ducktales, so you’d be forgiven for thinking that Shovel Knight is just an amalgamation of all the best parts of retro platforming with nothing of its own to contribute. The fact of the matter is Shovel Knight is so much greater than the sum of all its parts. Every single feature comes together so well that it’s no longer just a collection of borrowed mechanics and features of a bygone era, it’s the front-runner for the genre. An exercise in master craftsmanship from the folks at Yacht Club. Bravo! Encore! Encore! Overall: Dig out this masterpiece, which delivers fun in spades… and bury these awful puns.